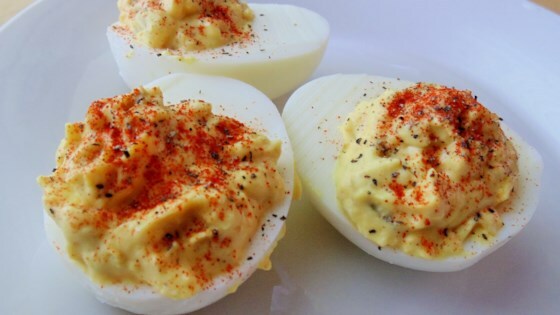 "Horseradish sauce and sweet relish sets these deviled eggs apart from the rest!" This is the ultimate recipe! Quit searching! For filling the eggs, snip the corner of a sandwich baggie. Fill with yolk mixture and gently squeeze onto egg white. Wow! Amazing! and even better with green onions(finely chopped) as a sustitute for the regular onion. Not a "classic" recipe, but we LOVED them. They definately have great flavor! I used only 2 tbls relish and used green onion. Very tasty.